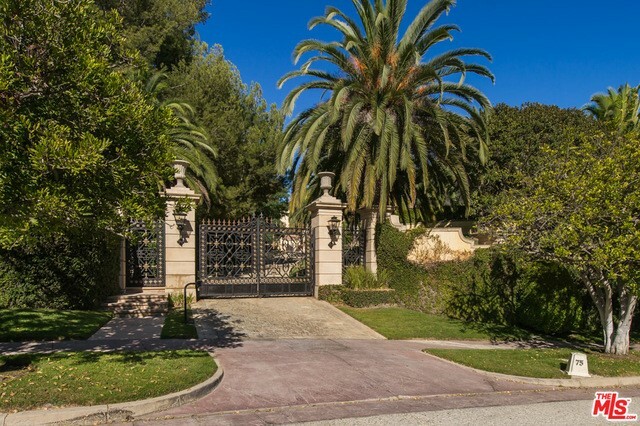 Rare opportunity to lease one of the most impressive homes in the gated Beverly Park community, COMPLETE with a variety of amenities and services for the most discriminating guests. This Tuscan Vineyard Estate is surrounded by lush landscaping and towering palm trees, exuding a feeling of Los Angeles glamour and European countryside. The large motor court with water fountain plus various private garages brings you to a grand exterior unlike any other. Enter into the 2 story soaring foyer with separate staircases and amazing floor-to-ceiling French doors leading out to the grounds. Downstairs in the basement, let vaulted ceilings enchant you, along with a sitting area and expansive wine cellar that can house all of the wine that is produced in the vineyard, on the property itself! The architecture of this home is unprecedented. It truly is a work of craftsmanship and art. Amenities include gym, mini "spa", as well as chef, butler, housekeeping, and full white-glove service.